My name is Georgi and my husband's name is Neil. We acquired Pickles from Thomas & Sylvia in Sooke, British Columbia when he was exactly 3 months old (2002) and already talking. We all live in Logan Lake - a high altitude town in the interior of BC near Kamloops. Our family also includes Neeka, our 6 pound Min Pin who was born in 2008. We spend a lot of time with Pickles and he is allowed much freedom. He has a cage and play stand in the living room and other areas in the house. He is free to come and go from his cage and is only locked in at his request when he's ready to go to bed. He is not clipped but chooses not to fly, except when startled. He possesses excellent flying abilities and is able to bank and turn and land with pin point accuracy on a hand or perch, but prefers to hitch a ride. Pickles has an amazing vocabulary (well over 100 words at last count a few years ago) and speaks in sentences. He knows what he wants and knows how to ask for it. We don't 'teach' him words, he picks it up from normal conversations between Neil and I, or us with him. He can copy all the local wild birds but his favorite are loons, crows and chickadees. He can do hundreds of different sounds - bells, whistles, sirens, creaky doors, burps, sneezes etc. When the weather is good, he likes to go outside to his aviary but only if we are in the yard. He's happiest when there are other neighbors or people passing by so that he can call to them and invite them to supper or ask them questions. We have a beautiful yard with lots of trees and shrubbery and even a small trout pond. Wildlife abounds in our area - moose, deer, bears, coyotes and wild birds which include eagles, hawks, loons and osprey. Wild birds are attracted to the pond for drinking and bathing and all the trees and plants are specific to bird habitat and food (berries etc.) so there's always activity to observe. We stopped using pesticides many years ago and have found that all the birds that we have attracted, take care of the harmfull pest population. We often go RV camping or rent cabins to fish or relax in nature. Pickles likes to travel so he accompanies us on our trips. We also have a backpack with screened sides so that he can go walking with us. He's not afraid of much, so he's easy to take anywhere. He especially likes to go grocery shopping and chat it up with anybody in sight. Pickles is friendly and talkative with most people, he's happy and playful, he likes to tease and sometimes be teased back, he's demanding yet entertaining and he's a well-balanced, secure and confident parrot. Pickles is well known within the parrot community through Good Bird Magazine (www.goodbirdinc.com) and the PickleStories i have written the last few years. 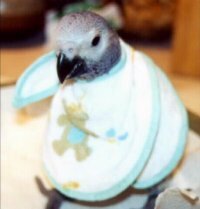 In 2010, I published the book 'Pickles The Parrot', a humorous story about our lives together and it's available in both paper and ebook at the links below . In 2011, I published the second book, 'Pickles The Parrot Returns' and soon after, 'Pickles the Parrot Speaks'. We hope you will check it out! You can also follow Pickles on FaceBook (https://www.facebook.com/georgiabbotts.picklestheparrot).